Update 1.7.8 is finally available! We have finished long and complicated work on improving the game boards. All 6 boards have been reworked, textures and detail have been improved. We added slots to left side of the boards where a player can place their checkers in narde. Stone board was removed from the game and instead of it we implemented a new wooden board. From now on green dots next to checker slots will indicate possible moves. To disable them you have to untick “tips” in game settings. We believe many will appreciate this new feature especially beginner players. We also improved the highlight of possible moves. Another feature now allows to move the game board to each side. Moving the board to the left reveals a panel with player information, current bet and the timer. Moving the board to the right reveals game options which affect gameplay. This allows displaying the board in full screen. In final we have added a Holiday theme to add some festive mood to our tavern. 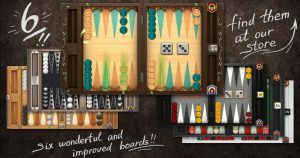 – All boards and checkers have been graphically improved. Try out your favourite board and marvel at the new graphics! – Added green spot indicators to show which checkers can be moved. This will prove convenient for many players and allow making faster moves. 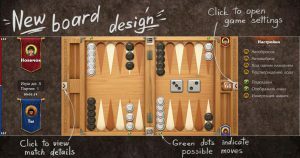 – From now on game options are located at the right side of the board. Drag the board to the left or click the popup button on the right side to view them. – Player, bet and time information is located at the left side of the board.